By far, Minneapolis decks receive the most abuse as part of their intended functions than any other part of the home; including the roof. Unfortunately, they are also usually the most vulnerable. The extended layout of these simple wood structures fully exposes them to the elements without reprise. And with Minnesota’s unforgiving winter conditions, decks face even more abuse during colder months as they remain exposed to heavy snowstorms. Minneapolis Deck staining is an important component of proper maintenance, and vital to preventing expensive repairs shortly after building a deck. Fortunately, our Minnesota painters are thoroughly trained to properly stain decks using the finest materials available. They can also complete the project within one day in most cases. We begin with a test to determine wood’s absorbency by spraying the deck with water. If the wood soaks up all of the water, it likely needs staining. If the water remains on the deck, the wood may not yet need staining (though it’s still a good idea to enhance the deck’s durability). Each deck staining project that we undertake begins with extensive preparation. The wood will be carefully inspected for any signs of damage, significant or slight. This includes areas grayed by the sun, warped boards, splinters, and so on. The entire deck is then thoroughly cleaned to remove any dirt, mildew, mill scale, and even old stains that have lost their usefulness. This is all done to ensure that nothing stops the wood stains from soaking into the deck’s boards. Our wood cleaners are effective at cleaning your deck quickly without harming nearby plant or animal life. Next, we treat the wood with brightener prior to deck staining. This step is often overlooked during deck staining projects, but it is one that will enhance the durability of wood while also improving its aesthetic value. Wood brightener will remove the graying that occurs under prolonged exposure to sunlight. It will restore wood to a more natural looking and visually pleasing state. Brightener also helps remove any residue that may have remained after cleaning, especially loose particles from former deck staining projects. Additionally, prepping wood with a brightener solution makes it more absorbent when applying the stain. When it’s actually time to begin staining the deck, we make no compromises on quality. Inferior staining solutions can begin peeling and seeping off the deck in less than a year. Not only will this damage the structure, it may also affect plants located near the deck. Lower quality stains will almost always result in expensive repair projects, so our professional Minnesota painters avoid them. 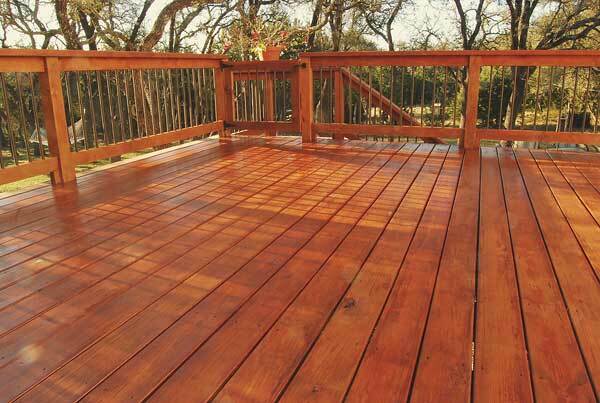 We always begin staining with the upper portion of the deck. That way, any stain that falls will land on wood that has not yet been treated, making it much easier to correct. All surfaces of the deck, including smaller regions and corners, are carefully covered with a fine layer of stain to maximize durability.